A username conflict occurs when an administrator deletes a user account, creates a new user account with the same username, and later tries to restore the deleted account. Also, if Outlook tries to connect to an account and it keeps asking for the password (even after verification that the password is correct), a name conflict could exist. 1. 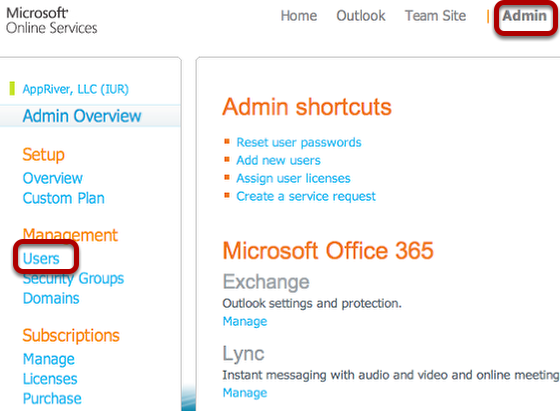 On the Admin Overview page, click Users under Management. 2. Click Deleted and select the user to restore. Then click Restore. 3. A new window will appear notifying of a user name conflict. 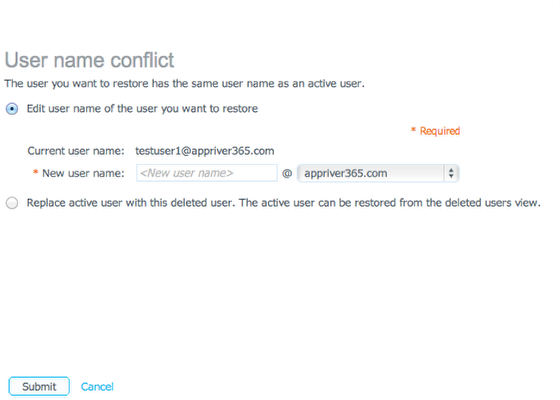 Two options are available to resolve the conflict: rename the user or replace the active user with the deleted user. To rename the user, leave the default settings which allows the username of the user to restore to be edited. Then rename the user and click Submit. To replace the user, select the option button next to Replace the active user with this deleted user. 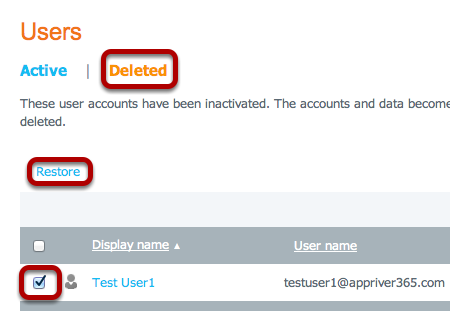 The active user can be restored from the deleted users view. To replace the active user with the deleted user, please ensure any new mail is backed up to a PST file so mail can be restored from this file in case of data loss. Once the selection is made, click Submit. 4. A green check mark should appear that verifies the restore was complete. Click Finish.